Posh manager Darren Ferguson watches a match v Brentford. 1 The stats don’t lie. In the last two and a half seasons Posh have played 117 Football League matches under the management of Ferguson and they’ve won just 47 and lost 52. The current run of form is not a temporary blip, it’s becoming the norm and for a club of Posh’s ambition it simply isn’t good enough. 2 Posh have collected five points from their last 12 League One matches. Last season they endured a run of five straight defeats and the season before that they lost their first seven Championship matches of the season. Good managers are quick to spot problems and fix them. It takes Ferguson too long to get to grips with a crisis and by the time he does it is often too late. Posh were outstanding in the second half of their last Championship season and yet were still relegated. Posh were pretty consistent in the second-half of last season, but left themselves with far too much ground to make up on the top two. 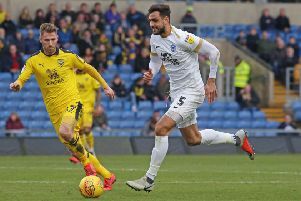 Remarkably given their current form Posh are still within striking distance of a play-off place, but it will need a change of manager to get there. 3 To an outsider Ferguson appears to have lost the dressing room. The manager, chairman and players all deny this, but this team folds too quicky under the first hint of pressure to be able to claim that all is well with team spirit. A poor Coventry side fought back from two goals down to beat Posh, Chesterfield could easily have won the Boxing Day fixture against Posh 6-0 and even a limited Colchester team beat Posh at The ABAX Stadium far too easily once they’d taken the lead. Posh should treat the rest of this campaign as a relegation battle and start fighting accordingly. Unfortunately under this manager the team have hardly shown any fight since the 1-0 win at Bradford City at the end of August. 4 Posh have still to visit top sides Bristol City, Swindon, Preston, MK Dons and Sheffield United this season. It’s a fair bet that Posh will have to do plenty of defending to get something from those games. Even when Posh were winning games under Ferguson, their defending could be chancy. Get some-one in who can develop a defensive strategy as Posh don’t have a very good one right now. 5 Posh have been so poor since October, Ferguson is on the verge of destroying his legacy. Managers can stay at clubs too long. Often fresh eyes and a fresh approach can galavanise a set of players. Much of Ferguson’s thinking has been muddled this season. He has stubbornly defended struggling players like Jermaine Anderson, Ricardo Santos and, to some extent, Michael Bostwick. Posh have become stale under a manager seemingly obsessed with sideways passing and a slow build-up. Maybe he doesn’t have the players now, but a successful Ferguson side has always played at a terrific tempo.